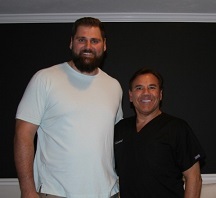 Dr. Robert Leonard, Chief Surgeon and Founder of Leonard Hair Transplant Associates, is pleased to announce that New England Patriots football player Sebastian Vollmer is a current patient and has endorsed the practice. Vollmer joins fellow NFL players Rob Ninkovich and Wes Welker in endorsing Leonard Hair Transplant Associates for its hair restoration expertise. Taking advice from his friends and teammate, Vollmer becomes the latest active professional athlete to endorse a hair restoration surgeon. Vollmer became aware of Dr. Leonard’s work and reputation by speaking with Ninkovich and Welker. At one point in his mid-twenties, Vollmer recalls having hair so thick that stylists would thin it out during hair appointments, but that changed over the last few years. Vollmer met Dr. Leonard and Dr. Matthew Lopresti at a charity event, and rather than wait until his hair aggressively began falling out, he immediately scheduled an appointment. “Rob (Ninkovich) pointed it out to me, and I really began to notice my hair thinning. I saw firsthand Dr. Leonard’s results with Rob and Wes, and knew that he was the right doctor for me,” Vollmer said. The 31-year-old Vollmer was born and raised in Germany, where he says that, while there is no stigma associated with male hair loss, it’s looked upon as an inevitable conclusion. “Men in Germany know they will most-likely lose their hair and that it’s a natural process, but they are less aware of treatment options, so I was happy to discover Dr. Leonard,” Vollmer said. The Super Bowl champion first office visit came in April 2016. After a consultation and review of his problem areas, Dr. Leonard recommended non-surgical treatments to stabilize the progression of his hair loss. “Sebastian has definite signs of male pattern hair loss, which is very common for men his age,” said Dr. Leonard. Dr. Leonard offers a variety of non-surgical treatment options including the Capillus272 PRO™ which provides patients a portable, non-surgical option to strengthen their hair, to stop progression, and to promote regrowth from the comfort and privacy of home. It fits easily and discreetly into a baseball cap. “It’s very easy. I can wear it when I am around the house, or just watching TV,” Vollmer said. With nearly 30 years of experience in cosmetic surgery, Dr. Robert Leonard serves as New England’s foremost authority on hair restoration, providing expertise in treating individuals concerned about their thinning hair or baldness.